I bought an inexpensive watercolour sketchbook while on our trip to Saskatchewan earlier this month. I am learning that the time I spend creating "no-pressure" watercolour sketches is improving my focus and strengthens my paintings. My in-laws in Saskatchewan live several hundred miles south of us, and when we visit in summer I am always a little envious of their lush gardens, vibrant roses, and colourful birds. The goldfinches were so sassy, and there were so many of them! I just had to sketch them, even if they wouldn't hold still for me, and the kids kept running over to check on me and scaring the birds away! I would love for this sketch to translate into a goldfinch painting - but I'm thinking something much more expressive; as sense of a rush of wings and colour rather than a bird "portrait." You'll be the first to see it if I try it. I saw part of this music video over ten years ago and always remembered it. The song is beautiful (minus the single expletive toward the end) and the video itself feels like a painting to me. 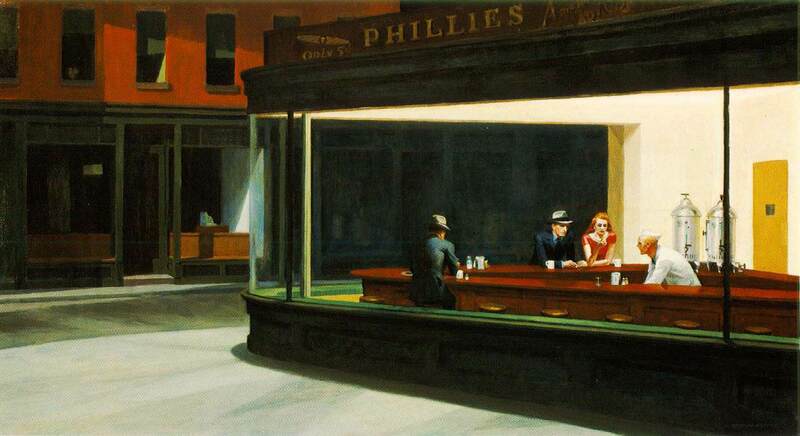 Like "Nighthawks" by Edward Hopper. I love the clean simplicity of the footage. Enjoy!